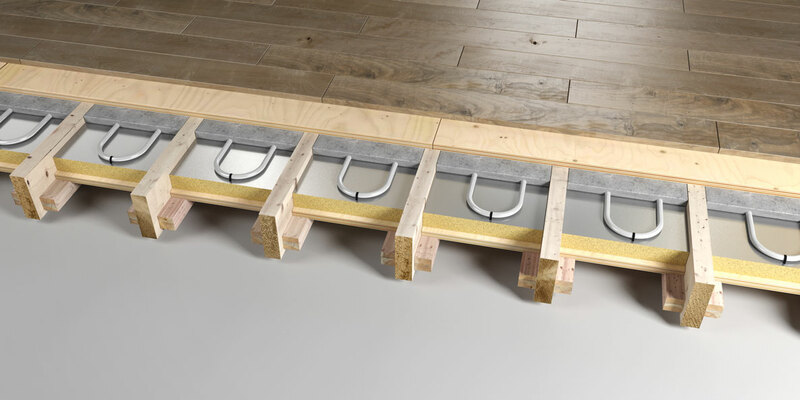 BaseTM UFH Biscuit Screed underfloor heating system is specifically designed for use within a joisted floor construction. Installallation directly between joists with screed layer finishing flush with the top of the joist. Pipe work is fixed directly to rigid type insulation with pipe clips allowing design flexibility. The Pipe work is encased within 25-30mm sand and cement biscuit screed layer ensuring a very even heat distribution across the floor area. One of the key benefits of the Biscuit screed layer is that it offers a high heat conductivity and heat retention. BaseTM biscuit screed system to incorporate 16mm PEX pipe to be installed to rigid Insulation panel using polymer pipe staples. Rigid insulation panel to finish 25-30mm below top of joist to be supported by timber framework. 25-30mm dry mix screed to finish with top of joist.